Mr Tabubil's parents (hereafter to be known as my Suegro and Suegra, or mis Suegros, collectively) are also living here in Santiago. 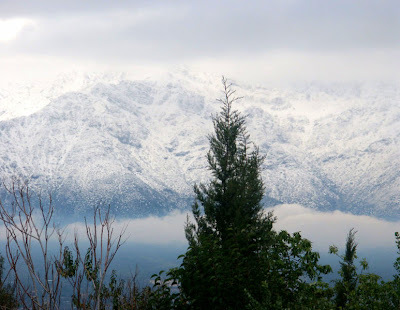 They left Chile and came here a year and a half before us, and knowing that they are here is one of the things that made moving very easy - knowing that we'd be so close to them again! 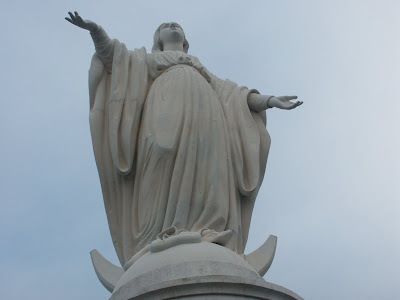 On the afternoon of our arrival, Mis Suegros took us to Cerro San Cristobal, a hill in the center of the city with a giant white statue of Our Lady at the top. The whole mountain is a park, with a zoo and a huge summer swimming pool. There are walking trails and an access road, but the nicest way to get to the top is to take the funicular railway from a small stone castle at the foot of the mountain, all the way to the top and watch the city spread out at your feet as you rise up. The funicular stops just below the statue. You climb up a flight of stone stairs and just below her skirts is a big open amphitheater that is used as an out door church. Gregorian Chants play thru loudspeakers all day. 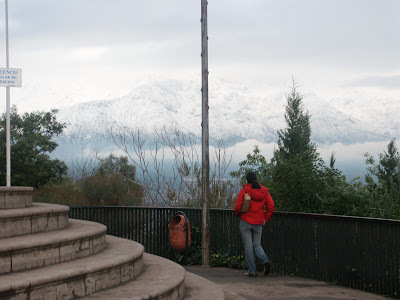 In winter and summer both, it's a lovely place to sit and look out over the city with the Andes all around your ears.